What happened to Dams Raid aircraft? Now available online and in all good bookshops! This website tells you something of the story behind the book, Breaking the Dams, which was published in April 2008. The website is updated regularly in order to provide further information that has become available since the book's publication, and also items of interest for anyone who would like to know more about the famous 'Dambusters'. The site is written, designed and maintained by the author of the book, Charles Foster, who you can contact here. 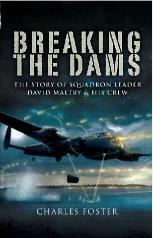 The book is the story of my uncle, Sqn Ldr David Maltby, and the crew with whom he flew on the famous Dams Raid - Operation Chastise - in May 1943. Four months later, on their return from an aborted mission to bomb the Dortmund Ems Canal, they all died when their aircraft went down in the North Sea. Only David’s body was recovered, picked up by a rescue launch. On the Dams Raid, David Maltby was the pilot of aircraft call sign AJ-J, ‘J-Johnny’, the fifth Lancaster to drop a bomb on the M�hne Dam, and the one which caused its final breach. He was then just 23 years of age, but already had 28 operations and a DFC to his name. The book tells the story of the crew, what made them join the RAF when they knew the risk was so high, how fate threw them together, and what happened to them in the months between Operation Chastise and their deaths. It also reveals controversial new evidence, published here for the first time, about the cause of their final crash. It is also the story of how the Dam Busters’ operation has become one of those events, beloved of journalists and TV documentary list-makers, which are supposed to epitomise Britishness. During and after the war it suited the RAF to keep alive the memory of a one-off operation which combined an audacious method of attack, technically brilliant flying and visually spectacular results. These alone would have guaranteed the Dams Raid a secure place in Second World War history. However, it reached its current status as a British cultural icon because of Guy Gibson and Paul Brickhill's books, published in the 1940s and 50s, and particularly the film, 'The Dam Busters', which was released in 1955. My mother, Jean Foster, n�e Maltby, was David's younger sister and was 18 years old when he was killed. David also left a widow and a ten-week-old son. The book examines what happened to the families during the war and afterwards, and how they were affected. Their sons, brothers or fathers had become famous but they had to cope with life and loss in the same way as did thousands of other British families. This website has further information about David Maltby, his crew, and other material about the Dambusters. Please look around, and let me know what you think. You can contact me here. Breaking the Dams has a published price of �19.99, but the publishers, Pen and Sword, and Amazon.co.uk are both currently offering it at a reduced price. Keep updated with Dambusters news at the Dambusters Blog.